The Constitution covers the fundamental principles but does not prescribe specific procedures for operating the club. Bylaws set forth in detail the procedures the club must follow to conduct business in an orderly manner. They provide further definition to the Articles of the Constitution and can be changed more easily as the needs of the club change. 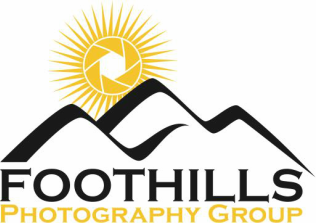 This club, as decided on by the founding members, shall be called Foothills Photography Group. It may be referred to herein as the Club. The aims of the Foothills Photography Group shall be the enjoyment, mastery, and furtherance of photography through cooperation, effort and good fellowship. The Club encourages its members to offer their talents in charitable activities as a service to the community. Membership in the Club shall be open to any person (16 or older) seriously interested in the art of photography and whose qualifications meet the requirements specified in the Bylaws. Members may be under 16 if part of a family membership. Three types of regular memberships are established: Adult, Family, and Student. Details of each membership type and associated dues may change from time to time and are described in the club's bylaws. The membership may be limited at the discretion of the Board. The club's fiscal year begins on March 1st of each year. Dues are payable at that time. A member shall be automatically suspended for failure to pay dues as stipulated in the Bylaws. The officers of the club shall be President, Vice-President, Secretary/Treasurer, whose duties shall be those customarily pertaining to those offices and are presented in more detail in the club Bylaws. Officers of the club are elected according to Article VII of the Bylaws. The management of the Club shall be directed by the Board of Directors, which shall be composed of the duly elected Officers, the Chairperson of each Standing Committee, and the immediate past President. The Board of Directors shall be called by the president to meet as often as necessary to transact the business of the Club. Special committees may be appointed by the President as required, and shall be discharged when the assignments have been completed. Chairs of these special committees are not members of the Board of Directors. Six members of the Board shall constitute a quorum for Board meetings. Actions of the Board must be by a majority of the quorum. Regular club meetings are held on the third Tuesday of each month. The Board of Directors may alter this from time to time to account for holidays, etc. Article VI -- Affiliation with other groups. The Club may establish affiliations with umbrella groups such as the Photographic Society of America and the North Georgia Camera Club Council. Section 1.01 There shall be two classes of membership: Active and Honorary. a) Active membership shall have three sub-classes: Adult, Family, and Student. (i) Adult membership shall be for individuals above the age of 16. Current annual dues are $40. (ii) Family membership shall be for members of the same family living in the same household related by birth, marriage, adoption or other legal dependants, including such common family relations as parents, children, spouses, grandparents and in-laws. Current family dues are $50. (iii) Student memberships are available for full time students (at high school or college). Those individuals under 16 must be a member of a family group as described above. Student dues are $10. (b) Honorary Membership may be awarded to recognize an individual's contributions to the Club. Dues are not required of those who have been granted honorary memberships. (i) Any member in good standing may nominate a candidate for Honorary Membership. (ii) Honorary Membership shall be awarded only upon a majority vote of the Board. (a) Any member in good standing may be elected to or retain office. (b) Any member in good standing may serve on standing or special committees. (c) Some meetings, programs, workshops, field trips or other events may be limited to members only. (a) Any person interested in the art and science of photography may apply for membership. (b) Membership requirements shall be established by the Board. (c) Application for membership shall be made by providing the Club with the following information: name, mailing address, email address, photographic interests, and signed disclaimer. a) Membership may be suspended or terminated by a majority vote of the Board. (b) Membership shall be terminated for non-payment of dues if dues are not paid in full by the end of the third month of the Club’s fiscal year. Section 2.01 Each member shall pay dues on an annual basis. Section 2.02 Dues for new members joining after the first half of the fiscal year (after September 1st) will be one-half of the annual dues. (a) For new applicants, dues will be payable with submission of the application. Dues paid will apply until the end of the current fiscal year. Section 2.03 Persons who have not become members may attend regular club meetings not limited to members only, but may not participate in club competitions, club-sponsored events or club decision-making matters and may not be qualified for club discounts. Section 2.04 Dues shall be non-refundable if either the member or the Club terminates membership for any reason. Section 2.05 The Board shall set annual dues for each membership classification. Dues amounts shall be published on membership application forms and Club newsletters and websites. a) Each person participating in any Club-sponsored event or competition does so of his or her own accord and at his or her own risk. The Club and its elected officers and appointed chairs assume no responsibility for the personal safety of the participants or the safety of any equipment or photographs of those who do participate. (b) Participation is acknowledgement by those participating that they, individually, assume all risks involved and will not hold the Club, its elected officers or appointed chairs responsible. Section 4.01 The club shall hold meetings each month devoted to guest or member speakers on photography related subjects. (a) Regular monthly meetings shall be held at the time and place as specified by the Board. (b) The Board may, at its discretion, cancel a regular monthly meeting. Section 4.02 Other meetings for programs, workshops, and field trips shall be arranged as determined by the Board. Section 4.03 Members may be charged a discounted fee for attending meetings, workshops, field trips and other events to help cover operating costs. Non-members may be charged a non-discounted fee to attend meetings and events that are open to non-members. (b) All members of the Board must be current Club members in good standing. (c) The Board may create additional standing committees as the needs of the club develop. Section 5.02 The Board shall transact all routine Club business, in addition to performing the duties specifically outlined in the Constitution and Bylaws, and generally determine Club policy. (a) President Duties of the President shall include being the Club spokesperson and he/she shall generally direct and supervise all Club activities. The President shall be the chief executive officer of the Club and shall have general supervision over the business of the Club and its officers, subject to the control of the Board of Directors. He or she shall preside at all meetings of the membership and the Board of Directors. In the name of the Club, the President may sign and execute contracts or other final instruments duly authorized by the Board of Directors. The President shall be a co-signer on all Club bank accounts. (b) Vice President Duties of the Vice President shall be to assume the duties of the President in his/her absence and to act as a club director on the Board of Directors. The President may, in the event of his or her absence or disability, designate the Vice- President to perform all duties of the President and, when so acting, the Vice-President shall have all the powers of the President and be subject to all the restrictions placed upon the President. The Vice President shall be a co-signer on all Club bank accounts. (c) Secretary/Treasurer Duties of the Secretary/Treasurer shall include acting as a club director on the Board of Directors; to maintain records of the minutes of all Board of Directors and business meetings. The Secretary/Treasurer shall also be the custodian of current and historical official documents of the Club including a copy of the current Constitution and Bylaws, the current membership roster, the current Board of Directors roster and terms of office, and the minutes of all business meetings of the membership or Board of Directors. The Secretary/Treasurer shall control, jointly with the President, the financial affairs of the Club. He or she shall keep its financial records, shall receive and arrange for the safekeeping of its funds, and shall pay out its funds only in such manner as defined in these Bylaws or duly authorized by the Board of Directors. In addition, he or she shall produce for Board review a semi-annual financial report detailing income and expenditures to date. The Secretary/Treasurer shall be a co-signer on all Club bank accounts. (a) Board meetings shall be held at least quarterly and may be called by the President whenever required. (b) Regular Board meetings shall be held at a time and place as determined by the Board. (a) Special meetings may be called by the President and shall be called upon the written request of at least three members of the board. At least 24 hours notice (personal, written, email or telephoned) shall be given. The business transacted at any special meeting shall be limited to that noticed in the call. Section 5.06 Board actions shall be communicated to members in a timely manner. If a member objects to any action taken by the Board, he/she shall notify the President of the objection and the President will present the matter to the Board for reconsideration at the next Board meeting. Section 5.07 All members of the Club shall be welcome at meetings of the Board. Members other than Directors shall have no vote but their opinions should be requested or volunteered on matters in which they are or have been involved. A time should be set aside at the end of the meeting for non-Board members to discuss or bring up matters not previously discussed. Section 6.01 The President shall appoint all committee chair persons and vice-chairpersons subject to the approval of the Board. The Board shall determine the number of committee members and shall approve the appointment of committee members. (a) Program Committee The Program Committee shall be responsible for the programs for the Club meetings. They shall provide the Publicity Committee, the Webmaster and the Newsletter Editor with material to promote the program. The Chairman should maintain a listing with contact information and area of expertise of potential guest speakers. (b) Social The Social Committee shall plan and provide refreshments at the regularly scheduled Club meetings; organize and implement plans for Club social events including a Christmas party. Costs of supplies are reimbursable. (c) Mentoring Committee The Committee will maintain a data base of those members who are willing to be mentors. This data base will contain such information that will facilitate a match-up between the mentee's needs and the mentor's abilities. The Committee shall assure that mentors are instructed in proper protocol as pertains to meeting situations. For example, meetings should be in public places or with chaperones as appropriate. The Committee shall promote the Mentoring Program through postings in the Club's web site, social networking pages, or newsletter. (d) Field Trips The Field Trips Committee will do the ground work for all club sponsored field trips. They will prepare publicity materials and promote the events at club meetings and through the communication media. (e) Webmaster The Webmaster shall be responsible for the maintenance and up-keep of the Club's internet web site and Facebook pages. This shall include, but is not limited to, uploading current information, removing outdated information, and suggesting and/or making changes to the sites as decided by the Board or as made necessary by changing technology. (f) Community Service The Community Service Committee shall actively pursue charitable opportunities for the club and its membership. The Chairman should coordinate arrangements and outings with the charitable organization. The chairman should promote these opportunities with the club membership and coordinate the activity. (g) Publicity The Publicity Committee will communicate monthly with the local newspapers and other local organizations and publications regarding the monthly meetings of the club. Additionally, the Committee will seek out opportunities to promote the club and its programs. a) In addition to the Standing Committees named above, committees to plan and carry out special organization events, functions and activities may be established by the Board as needed. (b) The Board shall appoint the chair of these special committees as well as members of the committee. These individuals are not granted Board status. (c) Special committees shall disband when their event, function or activity has been accomplished or as designated by the Board. (d) Each special committee shall prepare a report that shall be presented to the Board and/or membership on an annual basis or prior to disbanding. Section 6.04 Committee Chairs shall prepare reports of activities for periodic presentation at Board or Club meetings. Section 7.01 The Board shall designate a Nominating Committee at least two months prior to the last general meeting of the fiscal year, consisting of five Club members. Two of these Nominating Committee members shall be current Board members. The Nominating Committee shall prepare a slate of candidates for office. The Slate shall be included in the announcement of last meeting of the fiscal year. Any member in good standing can make additional nominations from the floor. All such nominations must be made with the consent of the nominee and shall require a “second". Section 7.02 Officers shall be elected by majority vote of the members attending the last meeting of the fiscal year (February). If there is more than one nominee for any office, voting shall be conducted by secret ballot. The candidates receiving the highest number of votes for each office shall be declared elected. After tabulation of the votes, the President shall announce the results. Section 7.03 The current President or a member designated by the President shall install the new Officers at the first meeting of the new fiscal year. Section 7.04 Terms of Office of all Club officers shall be for one year and shall coincide with the Club’s fiscal year. All officers can be re-elected to the same post. (a) If the office of President shall, for any reason, become vacant, the Vice President shall assume the duties of the President. (b) If any office other than that of the President shall become vacant, it shall be filled by appointment of the President with approval of the Board, but for a term no longer than the remainder of the fiscal year, at which time the office shall be filled by election procedures as outline in these Bylaws. Section 8.01 The fiscal year shall begin on March 1st of each year and end on the last day of February of the following year. Section 9.01 Robert’s Rules of Order shall govern parliamentary procedure during meetings of the Club or Board.